Inside: Whether you want to save money, get organized, waste less food, or just save time, this simple approach to a weekly meal plan can help. I am really loving the results of setting up a weekly meal plan, but it took me a while to actually enjoy meal planning. I tried the once-a-month cooking (and hated it) and then just winged it for a while. After that first attempt, meal planning seemed like so.much.work. But by not meal planning, our food expenses started ballooning. What is working for me right now, and has been for a while, is a very simple approach to meal planning. It’s one that is great for those of you new to creating a weekly meal plan for dinners or if you just want a bit of flexibility. Once a week, usually Sunday, I pull out a couple cookbooks and my laptop and search for healthy recipes for our dinners. Maybe you store recipe ideas on Pinterest. I like to store recipes in Evernote. Whatever works for you. If you are wanting cookbook ideas, one cookbook for weeknight meals I like is Healthy in a Hurry. Items already in your freezer or pantry you know need to be used can guide your weekly meal plan. Perhaps there is leftover ham you saved or that bag of frozen veggies that really should be used. Search for meal ideas that will incorporate those ingredients. By using what you already have you will save on your grocery bill for the week as well. Once I’ve chosen meals to use ingredients on hand, next I’ll add in some standard meals for the week that everyone likes. And finally, there are often new recipes I want to try, so one or two nights are set aside for those as well. If you are planning breakfasts and lunches as well, write those down, too. I take it easy with those meals as breakfast is usually cereal, toast or eggs and lunches are either leftovers or sandwiches. As long as those items are in stock at our house, those meals take care of themselves. Setting up a meal calendar makes it easier to look ahead and rearrange the weekly dinner menu when needed. The tool I like the best for this is Google calendar because I rely on it so much with the kids’ schedules and everything else. In Google calendar, you can go to “My Calendars” and click the button to create a meal calendar. If you don’t like using a computer calendar, feel free to use your planner or a piece of paper. Whatever works for you! What I like about using Google calendar is that I can move meal days around with just a click-and-drag. When a meeting or sports practice comes up, or new braces on a child means it’s better to have soup that night rather than something chewy, I can easily rearrange the schedule. Here is a screenshot of this month’s menus so far. I might plan two meals with chicken, so those meals are scheduled on days close to each other so I only have to defrost once or use the leftovers from one night to make the next night’s dinner. Some meals might use produce that degrades quickly, so those are scheduled for earlier in the week. You can also tell at a glance if anything needs to be pulled out of the freezer the night before. The calendar also lets me know that when the family schedule is particularly hectic, that isn’t the night to plan a meal with a longer prep period. Another tip: check the weather forecast. If there is a cold day during the week, that seems like it would be a soup or casserole night. A cool salad as a meal is a good idea on a hot and muggy day. Take your recipes to the kitchen and go through each one, seeing which items need to be added to the grocery list. Don’t forget the sides! And spices! I’m always running low on cumin, it seems. Ensure you have enough of each ingredient. Try setting up a rating system and note recipe results in your cookbook or app. For instance, in a cookbook, I might write “yes!” for a recipe that went over well or “NO” in caps if not. In Evernote, I use a 1-4 star rating tag system. If the recipe went very well and everyone liked it, it gets “****”. One star recipes (nobody liked) get deleted. I guess that means my rating system is really 2-4 stars. There are most likely a few meals that are eaten frequently in your house and are freezable. Nights that you cook those, sometimes make a double batch. It will make setting up your weekly meal plan quicker and easier next time and will be especially convenient for hectic nights. For example, sloppy joes and chili are meals easy to double and freeze the leftovers. When making a double batch of, let’s say chili, I’ll freeze half and then mark about two weeks out on the calendar “chili – freezer” to remind myself it is already made and one dinner idea for the week is already set. I also found using MyFreezEasy is a great way to quickly prepare several meals for weeknights in a short amount of time. If meal planning has failed for you in the past, give it another try! It will help stretch your food budget, reduce food waste, and help avoid the last minute dinner dread of not knowing what to eat. 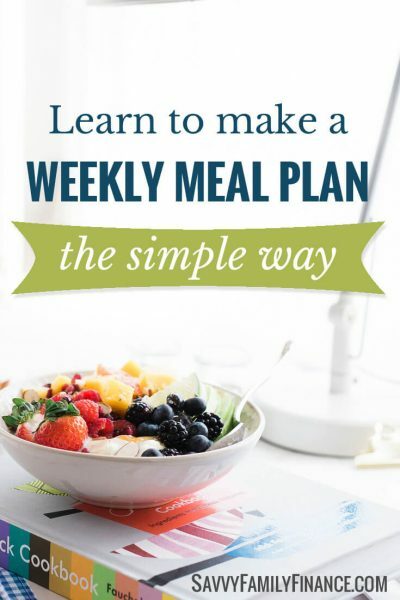 Do you create a weekly meal plan? What has (or hasn’t) worked for you?